The Grand Canyon Evidence of Massive Water Erosion, Fossils, Sediment Layers and Formations Supports a Catastrophic Event, the Biblical Genesis Account of the World-Wide Noah Flood of Earth - Genesis Alive! Grand Canyon and Mt St Helens made in a day canyon..
Monument Valley, 100 miles North of the Grand Canyon. Notice all the missing material! This is Remnant Topography of the flood washout. The Earth is just a sandbox for God. Evolutionary Geology claims all this rock was eroded by wind action. What a poor conclusion derived to fit an Old-Earth model and not considering a Flood one. In their efforts to abandon any possibility of the Bible account being true, these types of stories are framed as "science" and made part of textbook geology training. Right an ancient shoreline exits North of the Canyon, larger than most of the Great lakes. A clue to the massive Post-Flood erosion event that formed the Canyon? Sure could be. Post-flood deposits would have been soft for years. Force a natural dam after a flood like at the Missoula and you will have a canyon forming event; a lot of water over a short period of time. Guess what, Monument Valley above sits in the middle of the body of water noted as Grand Lake, what is now the Colorado River feeding the Grand Canyon!! An ancient shoreline rings the space sown in the lake diagram. It only makes sense that after the entire planet was overcome by the rift breakups, washouts, earthquakes and massive deposition that the surface of the planet would be unstable for years including the trapping of large unstable water bodies like this. Unstable events like this were occurring all over the planet. I can image Noah's family saw some awesome sites! (Image thanks to Creation Science Institute, www.creationscience.com) And where did all the Grand Canyon material go in the washout? Its not at the mouth of the Colorado River, It may be part of what makes up the 45 mile long sand dune deposit in Imperial Valley! 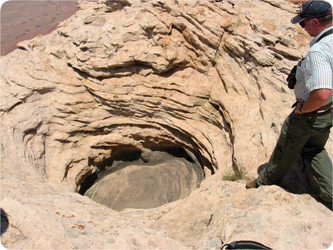 Funnels sinks like this one are found along the trench leading to the Canyon. (Red Circle above) These are formed by boulder's spinning at high speed in eddies. There are many other geologic features of massive water erosion across a 100,000 square miles here. These are exposed because there is little soil base to allow plant and tree growth, not to mention the lack of rainfall in this area. Beneath the accumulated soils of the entire earth there are features like these. Left, the Eastern Washington Scabland's now known to be cut by the Missoula Flood. For a century geologists were taught that features like this were slowly eroded by the river that flowed through them. Now we know that many of earth's features were formed by catastrophic means and the streams exist in the paths of these as leftovers. This event was created by a Glacier Dam in Montana (Missoula Flood) cyclically releasing water for over 100 years forming the Scabland features of Eastern Washington. The wave also washed in the gravels making up the floor of the Willamette Valley in Oregon 400 miles South West. The wave was found to be over 2,000 ft high as indicated by backwash deposits in the Cascades near John day, Oregon. So how can the official signs and textbooks ignore this fact explaining the Grand Canyon reflects the work of the Colorado River for eons? Dogma dies hard. Another reality strikes. 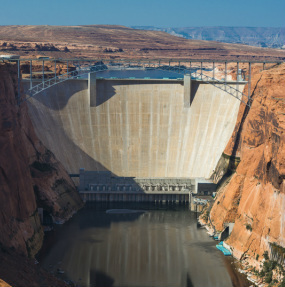 In recent times the Glen Canyon Dam nearly topped due to a huge runoff one year. The massive steel bypass valves controlling the overflow ducts were spit out as the tremendous force of water passed through them at high speed. When the water receded the valves and 20ft thick concrete liner were found eroded away. Subsequent studies determined that once water reaches a certain velocity, CO2 bubbles form and act as jack hammers, writing a new chapter about earth feature forming in the textbooks. 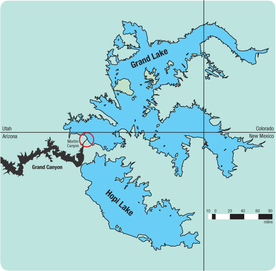 Remember the Nautiloid's: In the Grand Canyon there is a limestone layer that runs over 250 miles of the canyon from Arizona to Las Vegas, Nevada that contains tens of millions of fossils with an average of one nautiloid fossil per four square meters, with nearly one in seven fossilized standing upright! Famed geologist Steve Austin, one of the world's leading experts on nautiloid fossils. Dr. Austin points out, like many of the world's mass fossil graveyards, that this enormous nautiloid deposition that covers more than 5,000 square miles, provides indisputable proof of the rapid formation of this limestone layer. Contrast that to textbook explanation's which claim that such layers form extremely slowly as grain by grain settles to the bottom of a shallow and placid sea. (2) It should be noted that most of these creatures are of uniform age all across these rocks. The Karoo formation in South Africa is estimated a 20,000 ft deep and contains hundreds of Billions of fossils over a 200,000 sq. mile area. Reptiles typically drown and sink, Mammals bloat and float leaving an appearance of living in the higher sediments. In some instances not found at all as mammal remains disintegrate while floating. This is the failing of the entire notion of the evolutionary geologic chart. The chart is better described as graveyard markers of the flood event, not a sequence of great time and evolution. Evidence like the Moab human sandal prints and Dino footprints at the 10K ft level, also aquatic Plesiosaur' burials at high altitudes. How else can such evidence be explained? God saw all and it "Grieved His Heart". The massive fossil beds all over the earth are undeniable evidence of the flood event. Land animals would be expected to be found on higher ground in such a catastrophe, running to high ground. It would not be pretty picture of animals and man co-mingling to survive in those height's or in the water with scared and angry toothed animals of all kinds in a panic. A lot of water over a short period of time! One cannot be effected by adventuring into the Canyon depths and reflect about what the Rocks are really telling us. Not a "calm and placid" origin at all. This feature of the Earth is perfect evidence of the World-Wide Flood. God's Word tells us that the first judgment was by water, but another is coming by fire. We need to pay attention to these truths and warnings and search them out. The immensity of the Flood event challenges the ability of the mind to comprehend it. Reflecting upon it is both humbling and fearful at the same time. Trapping marine animals over 50ft in length thousands of feet high in the mountains is mind-boggling to conceive. They are calling all calling to us, as are the people that perished, See, Act! Look at all this Evidence! Many people say God is non-existent or religion is the author of death and pain. But this is not true, few people know that the Bible teaches that after Christ was crucified he traveled to a holding place in the earth that held the spirits of those lost in the flood! He spoke to them - He gave them another chance! He is the judge of people's actions and motives, He see's all and knows all. He is a good and understanding God, we can trust Him! To connect with the God who did this becomes important. Through Jesus Christ we have that venue too embrace the Creator and His Son, sent as a messenger to live and speak to us all. Christ mentions this event, He says; "Just as in the days of Noah, so shall the coming of the Son of Man be!" Now is the time, do not wait. Events in the world now tells us that the second Judgment the Bible teaches is coming, act before it is too late! God Bless you in your Quest for Truth!